The Arabian horse is one that descends of Arabian horses from North Africa and the Middle East, OA Saudi Arabia and Bahrein.The race is 5000 years old. today Arabs are bred all over the world. The bedouiden, they had a very strict breeding policy, the basic selection consisted of survivors of course, strong horses. but only the fastest, most productive, the hardest (physically, mentally) horses were used for breeding. These horses are the most valuable. Previously, to about 1950, by the extreme conditions of the Arab country, climate, etc., etc. died as more than 50% of the horses befor they were 4 years old! There are people who talk, and even go back to Saudi Arabia who believe that there are "new" old blood lines to get away, where the Asil horses originate from. There are only a few of the original strains left and are in the possession of the best there, and not to be obtained. 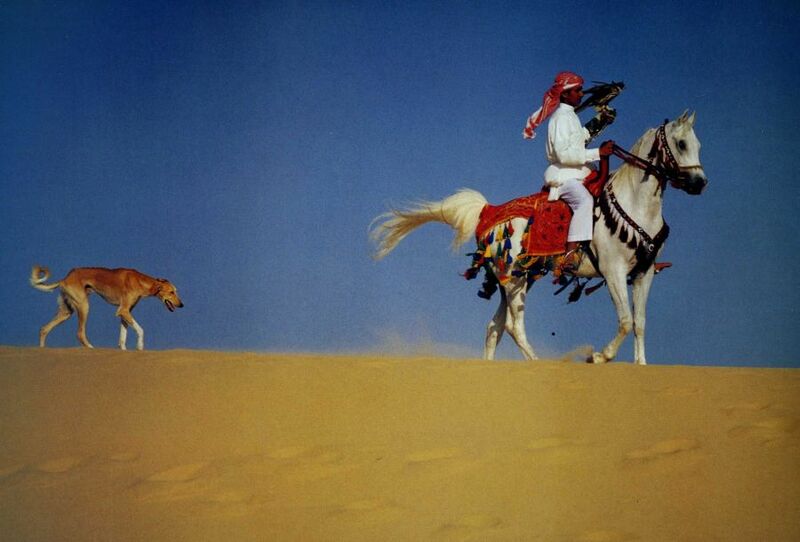 from the blue arabian horse catalog "
According to Arab peoples God created the Arab thoroughbred from the south. The forehead is broad because the blessing of Allah on it. And also, the prophet Mohammed the nomadic tribes ordered this horsebreed to be pure. The ancient Greeks believed that sea god Poseidon made the arab appear out of the waves.